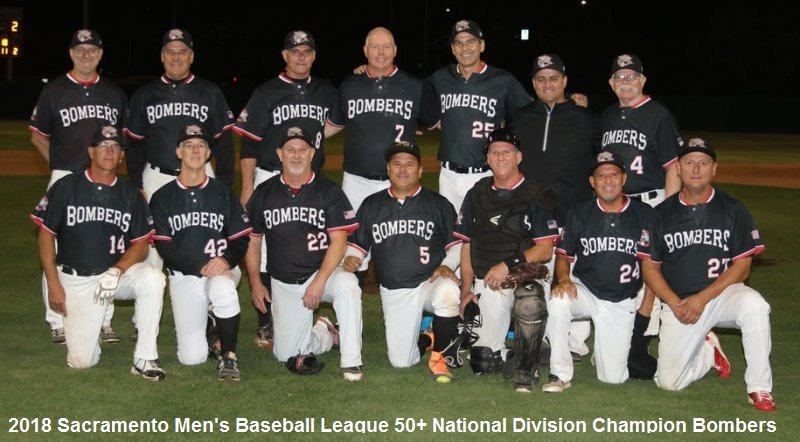 (photo courtesy of Jane Burkitt) The Sacramento Bombers had many firsts this year, with a mix of old relationships. Many of us have played together for many years and also play in Arizona at the MSBL World Series. The idea to form our own team come up when we played in Arizona in 2017 in the Father/Son tournament as the Capitals. We had many contributions from the players to get to the playoffs. A couple of late additions rounded out an already good group. This year was the first Sacramento Summer League team I’ve managed since 2008. Two players came out of retirement to play; Rick Crump and his cousin Tal. They made up a family trio of Crumps. Tal, Rick and Bob. Rick has had both knees replaced a few years back and it was fun seeing him back on field. He even stole a couple of bases to show off his new found speed! That gave some of us hope who are on the fence regarding the surgery. Our Sacramento Bombers won the Sacramento Men’s 50 National Division championship while playing in a very tough division against some of the best players in the nation. We ended up as the number two seed, as the Giants claimed the number one seed by one game. The league playoff format is a one game elimination to advance to a best of three series. We had to go through Gary Stonebrook and the Royals to get to the championship. Gary is an MSBL Hall of Fame member and owns a lot of rings from Arizona. He was on his game the night we played them, as we were down 1-0 going in to the bottom of the seventh. However, we were able to get a couple of runners on base when Rick Crump lined a double over the left fielders head to win the game. That was certainly an exciting walk off victory for the Bombers! The Championship pitted us against the number one seed Giants. They are led by Bobby Brown, a Sacramento Hall of Fame member and his teams are always competitive. It was our starting pitching that got us the series win as we were just a bit deeper. It was a great series against a great opponent. MSBL Player Designs Commemorative Baseballs. How Cool Are These? !